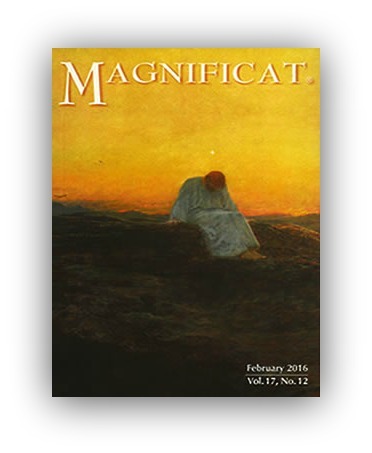 Personally, I am really clinging to the February issue of Magnificat magazine—an emotional “clinging” rather than physical, mind you, as I am forever misplacing my copy! It’s a Messy Maggie thing. The cover, especially, touches my heart. Jesus, alone and lonely in the desert, bows His head in the presence of His Father and considers (we can only imagine) the daunting prospect of His public life and mission. So what I’m thinking (and clinging to) is this: If Jesus Himself needed to spend time in prayer, how much more does an imperfect mama like me? And yet, when I look at the chaos and mess of my life, it is far easier to hide behind some earthly distraction, like Facebook and food and a good book or Netflix. Here, then, is a tip for a more fruitful Lent. Do you want to know what is working for me? I look at this image of Our Lord in the desert, I enter my desert (aka my messy kitchen) and for 15 minutes, I go meet Jesus. Literally. I set a timer and I deal with the mess. I do it for Him because He gets lonely. So there you go! This is what’s working for me, my friend, because I get really distracted and bored by the housework, but if I unite my suffering (aka cleaning) to Jesus, it becomes redemptive. The gift of Easter frees me from the many sufferings I have physically and emotionally. Easter helps me realize Jesus does not suffer anymore forever in heaven. Thank you. I needed that. I was just thinking that my Lent seemed so dry. Love this, Margaret. The simplicity and intentionality of your 15 minutes/day are precious to Jesus.